K&L Electrical undertake a wide range of electrical periodic inspections and electrical installation condition reports in Manchester, Liverpool, Warrington and St Helens, ranging from landlords electrical certificate, insurance companies, letting agents to full commercial certification of new & existing installations. We also carry out landlord electrical safety reports and electrical installation condition reports for insurance and licensing purposes (Public Entertainment licence) e.g. Theatres, Pubs, Clubs, and Hotels etc. Now offering FREE (PAT testing) for domestic landlords, insurance companies and letting agents, when booking an electrical installation condition reports and testing. We have a sensible approach to electrical testing and are fully aware of the increasing costs of staying on top of ever expanding electrical regulations, we will work with you to find the most economical way when rectifying any faults / problems, to ensure you have an electrical safty certificate. ￼The NIC-EIC Insurance Backed Warranty covers work done by contractors registered to the NIC-EIC Domestic Installer Scheme. See the benefits of using a contractor registered by the NIC-EIC. We carry out Electrical Periodic Inspection Reports and electrical condition reports for several local Estate Agencies; we will collect keys for access to properties for your convenience with the assurance that all our electricians and staff are uniformed and carry company identification. Each electrician is qualified to the new 17th Edition IEE Wiring Regulations and CITY & GUILDS 2391 Inspection & Testing Certification of Electrical Installations. We are fully insured with £5m public liability insurance with professional indemnity, fully compliant with the current health and safey legislation. Copies of these documents are available on request. The NIC-EIC Insurance Backed Warranty covers work done by contractors registered to the NIC-EIC Domestic Installer Scheme. See the benefits of using a contractor registered by the NIC-EIC. FREE PAT testing for landlords, insurance companies and letting agents. PAT testing can also be done at the same time as a periodic inspection report. By doing the two together you will save time and money. PAT testing at the same time could locate any potential safety risks with any electrical appliances. An electrical installation condition report will reveal if any circuits or electrical equipment are being overloaded, locate any potential electrical shock risks and fire hazards in an installation, identify any defective DIY electrical work, or highlight any lack of earthing or bonding. Tests are also carried out on wiring and associated fixed electrical equipment to check that it is electrically safe. For landlords, property agents, domestic, commercial or industrial see Landlord electrical safety reports and certificates. For further information on landlord electrical safety visits our page that gives a clear explanation of what is a electrical installation condition report and why it is required, alternatively you can contact us for further information or for a free no-obligation quote. If your a property agent, commercial or industrial we can discussed prices for electrical tests on a one to one basis. Please contact us for further information for on call-out charges etc, and management contracts. After the electrical tests K&L Electrical will provide you with a BS7671 Electrical Installation Condition Report along with a schedule of test results, evidence of any defects and departures from the IEE wiring regulations and a circuit chart to be placed either onto or near to the fuse board / consumer unit. Additionally you will be provided with professional technical advice from one of our qualified electricians in conjunction with notification and advice relating to the frequency and extent of required future periodic reports. 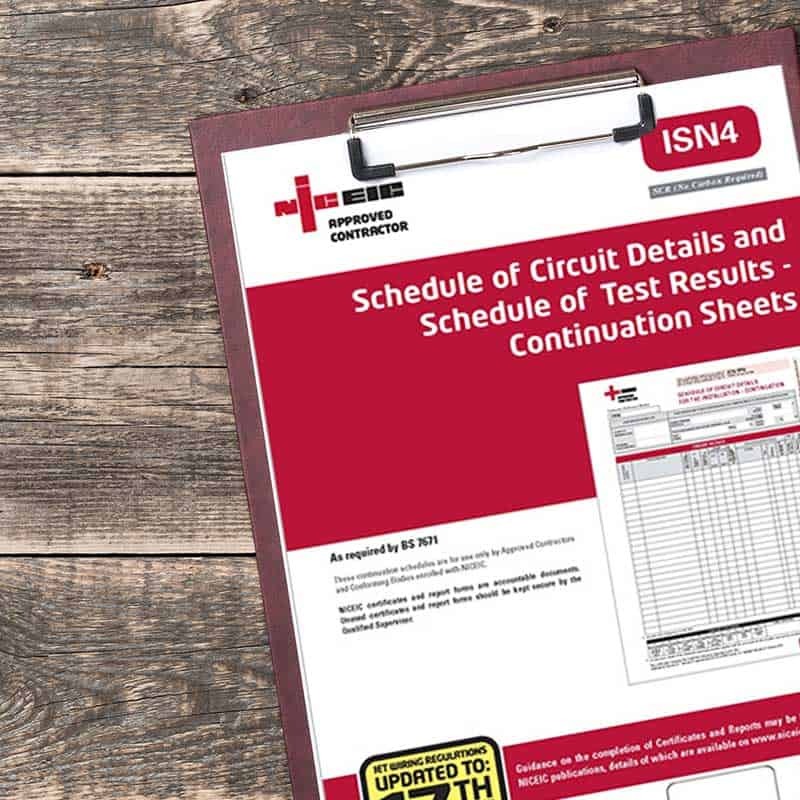 The table below provides guidance on the frequency of formal inspections of electrical installations as well as routine checks, the time interval between the issuing of the Electrical Installation Certificate on completion of the work and the first inspection. 1. Particular attention must be taken to comply with S1 1988 No 1057. The Electricity Supply Regulations 1988. 2. S1 1988 N0 635 The Electricity at Work Regulations. 3. See BS5266: Part : 1988 Code of practice for the emergency lighting. 4. Other intervals are recommended for testing operation of batteries and generators. 5. See BS 5839: Part 1: 1988 Code of practice for system design installation and servicing. 6. Local Authority Conditions of Licence. What tests are carried out on an electrical condition report? 1. Details of the electrical system are recorded with the owners name and property address. 2. What type of installation is it, domestic, commercial or Industrial. 3. Make of the fuse board or consumer units it has and Number of circuits used. 4. Number of sockets, lights, etc, also what’s on each circuit. 5. Visually Checking for any defects. 6. Dead testing of each circuit to obtain test results to check the safety of each circuit. 7. Live testing of the circuits to check they are safe. 8. Check that the correct cable sizes are used on each circuit. 9. Check to see if the main earthing conductor is present and correct. 10. Test if the gas pipe is earth bonded and installed correctly with the correct size cable. 11. Check if main water pipe is earth bonded and installed correctly with the correct size cable. 12. Check the RCD’s are working correctly, if fitted, and the right size milliamp is used, also test to see if it tripps in the correct time.